B+B Capital is bringing an 11-story condo building to 251 West 14th Street in Chelsea. Designed by ODA Architecture, the 11-unit building between Seventh and Eighth avenues will have full-floor residences ranging in size from about 1,700 square feet to 2,500 square feet. 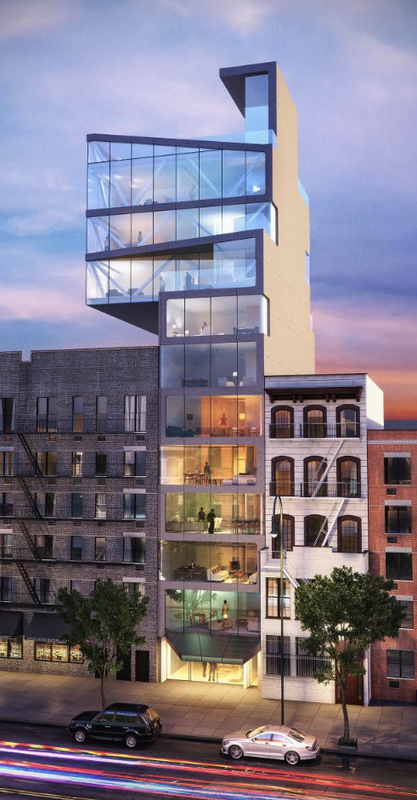 As shown in the rendering above, the structure will rise between two old tenement buildings, with the top three floors jutting over its shorter neighbor, like a descending L-block in Tetris. The two-bedroom to four-bedroom units will have 10-foot ceiling heights and private elevator access. There will be a duplex penthouse with outdoor space, and upper-floor apartments will have views of the Hudson River. Pricing will start at a demure $3 million, the New York Daily News reported. The lot is currently occupied by a four-story walk-up built in the 1920s. The developer purchased the property from the Church of Our Lady of Guadalupe at St. Bernard last year for $7.5 million. Permits were filed in September, NY YIMBY reported. Amenities will include a doorman, roof deck and bike storage. Bracha New York at Keller Williams NYC is handling marketing and sales. The units are expected to open for sale in Fall 2015.